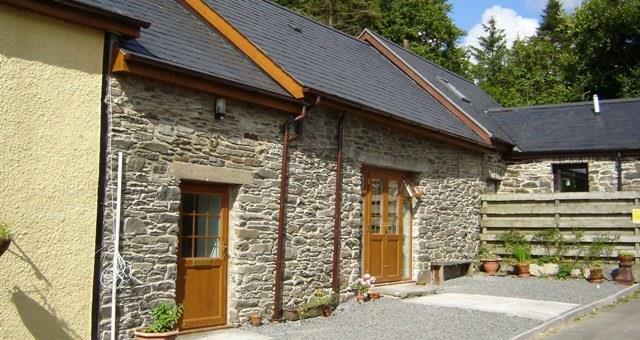 Red Kite Cottages01974 831540work Self-cateringHen Ysgubor (part of Red Kite Cottages) is a beautifully renovated barn in the heart of Wales providing comfortable self catering holiday accommodation for a family or a group of friends. Located in a small hamlet in the magnificent Cambrian Mountains, it provides an ideal base for walking, cycling, fishing, bird-watching, horse riding, surfing, golfing or simply relaxing in the beautiful and inspiring countryside. The cottage consists of two bedrooms (sleeps 4), lounge, fully fitted kitchen-diner equipped with a washing machine, dishwasher, dryer, iron and ironing board, fridge, freezer, microwave oven, and everything that is needed for a comfortable and enjoyable stay. There are two upstairs bedrooms; a master bedroom with a super king size bed (which can be transformed into two single beds) and a second bedroom with two single beds. The lounge is equipped with a television with a CD player and a mini audio system with an iPod station, so you can play your favourite music. There are two shower rooms with toilets (one upstairs and one downstairs) with a complementary welcome gift, including natural and environmentally friendly toiletries. Towels(except beach towels) and bed linen are provided. A private patio with a garden table and benches, sun lounges and a barbecue are available to enjoy. Although there are no special facilities or proper access for wheelchair users, we will make every effort to accommodate people with disabilities. Some guests might enjoy the choice sleeping on the ground floor sofa bed rather than the second bedroom, as there is a shower room & toilet on the same level. We regret that no pets are allowed except guide-dogs. All guests are kindly requested to refrain from smoking within the cottage. Hen Ysgubor (part of Red Kite Cottages) is a beautifully renovated barn in the heart of Wales providing comfortable self catering holiday accommodation for a family or a group of friends. Located in a small hamlet in the magnificent Cambrian Mountains, it provides an ideal base for walking, cycling, fishing, bird-watching, horse riding, surfing, golfing or simply relaxing in the beautiful and inspiring countryside. 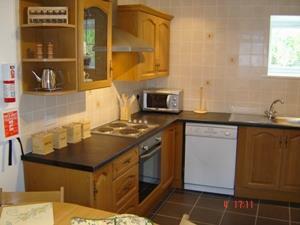 Special offer and discount of £25.00 per booking. Does Not include school holidays or short breaks. Please phone 01974 831540 or e-mail chris@redkitecottages.com for discount. Travel Cot available Some French, German and Spanish spoken, but not fluent. Conservation and wildlife area with pond. Under 16's to be with parent or guardian in the conservation area. Ideally positioned on a National Cycling Route and amongst a variety of spectacular walking paths climbing higher into the Cambrian Mountains. Also within a short distance to the spectacular Teifi Pools being the start of the River Teifi and ideal for fishing and rambling, and only twenty minutes drive from the beach. Red Kites, buzzards, ravens, curlews, cuckoos and many other bird species are frequent visitors around the cottage; even an otter has been seen wandering through the rear garden. There are local pub within 1 - 2 miles serving good homemade food and real ales. The cottage has a rear patio area. Guests can use owners electric dryer for a small fee Children welcome from any age. Nearest airports are Cardiff, Bristol, Liverpool, Manchester and Birmingham.